In what can be considered one of the greatest match-ups in March Mayhem history, Valve and BioWare collided and The Escapist shook but after the air settled, Valve has come away victorious. Valve's journey to win this year's March Mayhem: Developer's Showdown title was not easy. In Round 5, Valve was pit against the social media game developer Zynga, who had already taken out NCsoft, Infinity Ward, Rockstar North and Square Enix. This match-up lead to the most votes in any March Mayhem poll, totaling over 48,000 combined votes. Fans from different development communities around the world came in support of Valve to suppress the support of 85 million Zynga Facebook fans. At the end of the day, Valve brought Zynga down and moved into the Final Showdown, only to meet another community favorite, BioWare. BioWare had just recently knocked out the gaming juggernaut of Blizzard in yet another really close March Mayhem Field of Four match-up. Needless to say, the stage was set for an amazing Final Showdown between two beloved developers. BioWare and Valve's communities went back and forth for 3 days, each leading for a short period of time before having the lead taken away from them. In the end, BioWare was only defeated by 159 votes, which ended up being .6% of the overall vote total. The competitive respect was obvious as congratulations from both sides of community were heard on our forums. 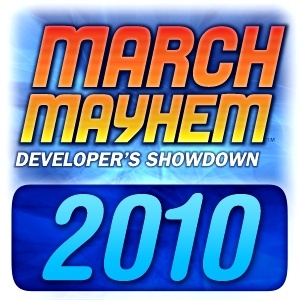 Thank you to everyone who participated in this year's March Mayhem: Developer's Showdown and for the new communities members, we hope you stick around and enjoy everything The Escapist has to offer. A special thank you to Astro Gaming and Gunnar Optiks as our prize sponsors. The winners will be contacted over the next week and will be announced shortly after that. For a final look at the brackets, please click here or jump right over to the March Mayhem forums.